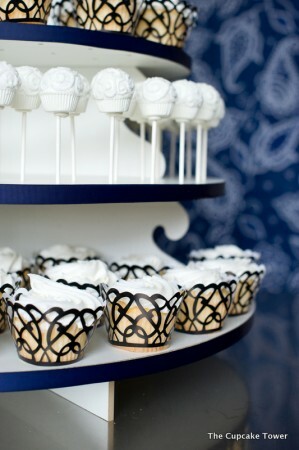 Cake pops and cupcakes are incredibly popular treats for a candy buffet or sweets table. When I was planning the minnies’ pink and green candy buffet, it was a challenge to display the cake pops and the cupcakes together. In the end, I placed the cupcakes on a 3 tier tray and the cake pops in little containers. 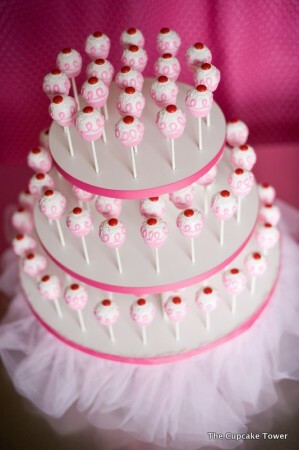 The small cake pop tower from The Cupcake Tower is a perfect solution for a candy buffet with cake pops or a combination of cake pops and cupcakes. The three layer tower can hold up to 92 cake pops or 72 cupcakes. What I love about this tower is that it is incredibly versatile! You can reverse the layers to a flat side for cupcakes or use the side with holes for cake pops. No worries about storage, either. 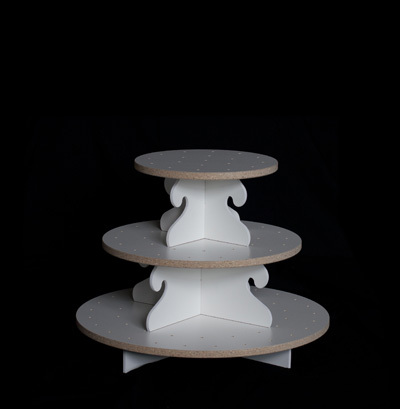 After the party, simply wipe the laminate coating of each layer and disassemble the cake pop tower to store flat in even the smallest space. Decorate your cupcake tower with ribbon to match your party theme. Easily remove the ribbon and replace it with other colors for another event. I wish I would have found this party planner’s treasure before the party this spring. But I’m certainly going to put my small cake pop tower to good use in the future. The possibilities are endless. such a cute idea for a party! WOW, I could have used this a couple of weeks ago for my youngests 2nd birthday and my first real attempt to make cake pops! I bought the paper one from wiltons from AC moore and gave up, I thought it was way to difficult to put together and was glad I had used a 50% coupon to buy it. Thanks for sharing. So smart and so cute for a party to change the ribbons out!